Tampa – February 10, 2014 – The prize list for the 2014 Tampa Equestrian Series is now available online by visiting www.stadiumjumping.com. Stadium Jumping, Inc., one of the nation’s leading horse show production companies, will be hosting the two week equestrian event at the Bob Thomas Equestrian Center at the Florida State Fairgrounds in Tampa, FL. New for 2014, the 42nd Annual $200,000 American Invitational presented by G & C Farm, will be held under the lights at Sun Life Stadium on April 5, 2014. The world’s top equestrians will come together for Tampa Equestrian Series’ two weeks of competition, held from March 26 – April 5, 2014, to vie for the winning titles at this prestigious event. The Tampa Equestrian Series will kick off its two weeks of competition with the Tampa Bay Classic, which is scheduled for March 26-30, 2014. It will include the $25,000 Tampa Bay Welcome Stake on Friday, March 28, the $35,000 Grand Prix of Tampa on Sunday, March 30, and the $3,500 USHJA National Hunter Derby. Premier hunters will also be featured with divisions for professionals, juniors, and amateur-owners. The Tournament of Champions is next, and will be held April 1-5, 2014, featuring a full array of hunter, jumper and equitation events. The 42nd $200,000 American Invitational, presented by G&C Farm, which will take place on Saturday, April 5, 2014 at Miami’s Sun Life Stadium. America’s “Super Bowl of Show Jumping” is a historic event, which brings together the top horse and rider combinations in the world. Invitations for the event are extended to the top thirty equestrians on the USEF National Computer Ranking List, plus past and present Olympians and other top invitees. Annually, this event showcases exhilarating equine power, amazing speed and agility, and equestrian excellence at the home of the NFL’s Miami Dolphins. The day is filled with extraordinary entertainment and activities for the entire family to enjoy. Tickets for the Saturday night spectacular are on sale Tuesday, online at: TicketMaster.com. Ticket prices are $29 for Children and Adults and $24 for Seniors 55 & Older. Group Tickets are $24 each for 10 or more persons. For more information on Stadium Jumping, Inc. and the 2014 Tampa Equestrian Series, please call (941) 744-5465 or please visit www.stadiumjumping.com. Lee Cesery and Swagger. Photos by Emily Riden. Tampa, FL – April 4, 2013 – Dreary skies and persistent heavy rain didn’t deter hunter riders from today’s classes at the Tournament of Champions. Instead, the day of bad weather simply granted riders a change of venue at the Bob Thomas Equestrian Center as they moved from the traditional outdoor hunter rings, indoors to the Charlie Lykes Arena. Under the cover of the arena, Lee Cesery bested the day’s field of Amateur-Owner Over 35 Hunters aboard Swagger. The pair finished first over the initial of the two courses designed by Robert McCune and second in the handy class. “I just bought Swagger the second or third week of HITS Ocala. I did him in the Adults one week, and then we moved him up to the 3’3″. 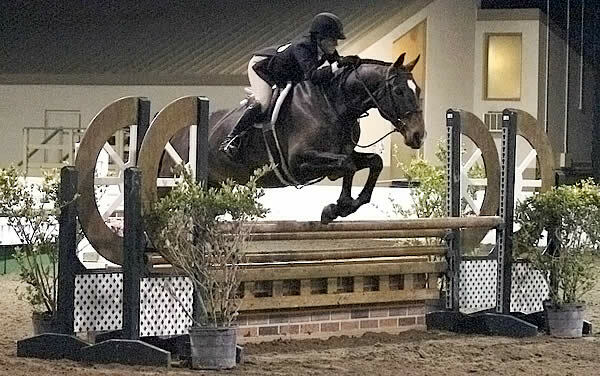 He’s been great, and he gets better every week,” Cesery shared regarding the 9-year-old Hanoverian, known around the barn as Bentley. Cesery also competed in the same division aboard her second mount, Marquis, finishing third in the first over fences class with him. Finishing just ahead of Cesery to earn the blue ribbon in today’s Amateur-Owner 35 and Over handy class were Robin Swinderman and Inxs. In the Amateur-Owner 18-35 Hunters, Elizabeth Degolian is leading the way in this week’s division point standings after finishing first and second in today’s classes aboard her mount, Quite Simply. Degolian has owned Quite Simply, or “Teddy,” for about a year, and the seasoned horse was unfazed by the new show ring today. The handy course over which Degolian and Quite Simply earned the blue, opened over a trot jump at the far end of the arena, off of which riders took a tight turn to the left around to a three fence diagonal line that finished with a vertical-oxer in-and-out. From there riders continued on the right lead down the outside line before coming to a finish over a long bending line across the opposite diagonal. Also earning a blue ribbon in the Amateur-Owner 18-35 Hunter division were Alexis Silvernale and Bryant Park, finishing first in the division’s opening class. All riders in the two Amateur-Owner sections will return to the Bob Thomas Equestrian Center tomorrow to compete in the three remaining classes in each of their respective divisions. The five-day Tournament of Champions is the second portion of the two week Tampa Equestrian Series. The ‘AA’ rated show includes classes for juniors, children and professionals a like. For more information on the Tournament of Champions, the Tampa Equestrian Series and Stadium Jumping, visit www.StadiumJumping.com. Greg Crolick and Grey Street swept first place in all five classes of the Green Working Hunter division at the Tournament of Champions. Photo By: Emily Riden. Tampa, FL – April 3, 2013 – Day two of Stadium Jumping’s Tournament of Champions marked the first day of the crowning of the show’s division champions. Among the first to receive tricolors today, were Greg Crolick and Grey Street who swept the Green Working Hunter division taking home all five blue ribbons. After winning three first place ribbons yesterday morning, Crolick and Grey Street returned to the Main Hunter Ring at the Bob Thomas Equestrian Center to add two more of the top rosettes to their growing string. Grey Street was originally imported just three months ago as a jumper, but with his continued success among the top-level competition at Tampa, it’s clear that he’s found his calling in the hunter ring. “He’s got that kind of personality to be a great hunter. He’s a lovely ride. He’s really super easy to ride, and he has kind of that old-school Thoroughbred canter. It really reminds me of an old Thoroughbred. He’s kind, no vices, and he’s really just an all-around nice horse,” Crolick articulated. The division reserve championship went to Hunt Tosh and Whiskey Blue, owned by Douglas Wheeler. The two First Year horses, Grey Street and Whiskey Blue, have both been consistently strong performers – Whiskey Blue claimed the First Year Green Hunter championship in the first week of the Tampa Equestrian Series, the Tampa Bay Classic, and Grey Street earned the reserve champion award in the same division. 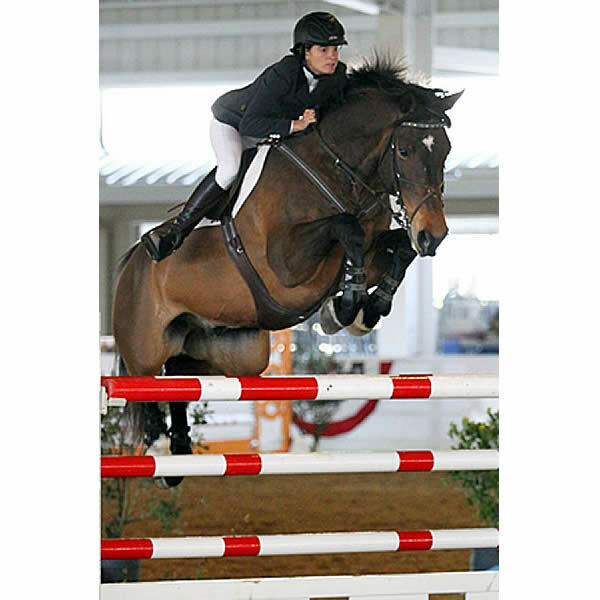 Adrienne Iverson and Redfield Farm’s Maximus have also seen continued success bridging the two weeks of the Tampa Equestrian Series. The defending Green Conformation Hunter champions returned to win the honor again this week. “Max was wonderful today. He’s just been very consistent these past two weeks. I’m really proud of him. He couldn’t have been better,” Iverson expressed. Iverson and the stallion finished first and third over today’s Robert McCune designed courses and rounded out the division with a first place in the under saddle class. “He’s very docile. He’s well mannered, especially for a breeding stallion. We’re careful with how we manage him, but he’s very easy to deal with,” Iverson said of Maximus who is currently standing at stud at Redfield Farm. Finishing behind Maximus in the reserve championship position were Winn Alden and Cakebread. The pair finished first and second in today’s Green Conformation Hunter classes. The day’s competition concluded in the Main Hunter Ring with the High Performance Hunters where Caroline Kellogg’s Trendy was named champion. Kate Conover and Hunt Tosh have shared the ride on Trendy throughout the Tampa Equestrian Series, but it was Tosh who had the reins today, riding Trendy to the first and third place finishes over fences. Alden returned to the ring on another mount, City of Angels, owned by DC Sales & Entertainment, to ride to her second reserve championship award of the day. Alden was introduced to ‘City’ just last week, but has enjoyed getting to know the horse. “He’s my favorite kind of ride because I can just chuck the reins and let him do his job. He was great. He loves the big oxers out there, and they were perfect for him. He just picked up the rhythm and never stopped,” Alden stated. The hunter portion of the Tournament of Champions continues tomorrow with the Amateur-Owner Hunter divisions. For more information on the 2013 Tampa Equestrian Series and the Tournament of Champions, visit www.StadiumJumping.com. Aaron Vale piloted Palm Sunday to the top of the leader board, scoring the quickest of only three double-clear efforts. Photo By: Kendall Bierer/PMG. Tampa, FL – March 29, 2013 – In a speedy fashion, Aaron Vale piloted Palm Sunday to victory under the spotlights during the $25,000 Tampa Bay Welcome Stake at the Bob Thomas Equestrian Center. The anticipation was tangible as eight riders moved into the heated jump-off this evening. Riders fought a battle to the top as they tried to qualify for the steadily approaching $200,000 Gene Mische American Invitational to be held at the Raymond James Stadium Saturday, April 6. With Vale’s win tonight, he has sealed his spot in the field of entries. A field of 31 riders showed in the Covered Arena over Michel Vaillancourt’s first round course. It began with a large oxer with twin stone pillars leading to a vertical, where riders then had to make a left turn to move through the diagonal blue-and-white vertical. A right hand turn over the green and purple oxer on the far side of the ring prepared riders for the technical opening fence leading to the triple combination heading toward the out gate. Riders then had to take the outside double combination where they were faced with a vertical-oxer, and then make their way over the vertical set at the far end of the ring. It was fence 11 that saw the most rails fall with ten riders finding fault. After landing from the red-and-white skinny, they moved forward over the large final oxer. Jordan Coyne and Lazaro were the first to master the track with a fault-free round. She was the tenth in the order of go, but she certainly set the standard with only seven other pairs navigating the course leaving all rails in their place. Eight horses in total continued on to the jump-off, adding pressure as the riders attempted to break the beam, while still navigating the technical course with accuracy. The jump-off course began with the first round’s opening oxer, and was followed by fence 14, which was fence four from the first round set backwards. With a hard rollback to the right, riders took fence two from the first round in the opposite direction, and made a hard right rollback to 7b of the triple combination. The wide red-and-white oxer forced riders to take a left turn to the double combination, where they then made a hard left to the dreaded skinny vertical. Upon landing, riders raced for home over the final liverpool obstacle. Coyne and Lazaro were the first to compete over the final test, and with a number of riders coming in behind them, they knew they needed to provide a time and a challenge the other riders would be forced to chase. Coyne picked up a speedy pace to the first fence, and kept the solid pace and tight turns on target. The nerves were high as Coyne sped through the double combination, but all rails stayed in their cups as the horse and rider sliced the outside turn to the skinny, took the oxer with ease, and stopped the timers in 42.936 seconds posting the first of only three double-clear efforts. Vaillancourt’s short course soon became the story as faults consistently knocked the teams out of the top rankings. It wasn’t until Wordley and Quick Blue Z took a go that riders began to see the light of a possible victory. Wordley was the first to pilot his mount through the intertwining obstacles, using a different method to succeed – speed and a slight amount of conservancy. Unlike Coyne, Wordley took a bit of time with the grey gelding, falling nearly four seconds behind Coyne. Michael Hughes and Dromma, owned by Vanessa Mannix of Calgary, Alberta, gave the other riders a run for their money. Hughes used speed to his advantage, and as the crowd held its breath, the horse and rider made their way through the track. It was an unlucky rail at 9b that sealed their fate in the eventual fourth place spot. They finished with a four-fault score in 42.149 seconds. Aaron Vale blasted out of the in gate with his eye on the prize. He spurred on Palm Sunday, owned by Amen Corner Farm of Folsom, LA, taking the tight turns necessary while maintaining accuracy over the impressive obstacles. Vale used the opportunity to open Palm Sunday’s stride after the double combination, clearing the skinny and breaking the beam in 41.122 seconds. Vale posted the fastest time of the night, proving that the race against the clock was no deterrence for the focused pair. It was Callie Smith and Captain Krutzmann, owned by Smithfield Farms, LLC of Bedminster, NJ, who finished with the fifth place award. Although they took a more conservative route than their competitors, Smith and Captain Krutzmann found fault at the last obstacle of the short course, the liverpool. It was heartbreak for horse and rider alike. Vale had also shown his other mount Zippo II, owned by 2VR Show Jumpers of Morriston, FL, at the beginning of the jump-off. They had tried to follow in Coyne’s path early in the order to return, but Vale accrued 8 faults with his more recent mount, ending with a time of 45.443 seconds to take the sixth place prize. “I didn’t ride the first line very well on Zippo-he’s kind of a newer horse for me, He’s got a right drift, so where we wanted to do six, I did seven when he jumped way to the right,” Vale elaborated. I didn’t really get what I wanted on him, but Palm Sunday I’ve had him almost a year now. Vale continued, “There were a couple things – I figured I could just be quick away from the fences; I made sure to really line up the first line and get down there in the six which he did well, and then boy he ducked in and just kind of cut like a barrel horse off of number two. He was super across there, and then as soon as I hit the ground I ran. I was just fast away from the jumps and tried to make sure I got a good enough approach to clear them. I just played to his strengths in the jump-off their tonight. Tomorrow will welcome the Junior and Amateur-Owner Jumpers to the Covered Arena for another day of competition, while the Adult and Children’s Jumpers will have the opportunity to showcase their skills in the race against the clock. Sunday afternoon will welcome top riders to compete in the long-awaited Grand Prix of Tampa where riders will compete in the battle of the best. Tampa, FL – March 13, 2013 – The Tampa Equestrian Series is pleased to announce that they have extended the closing date for entries and stall reservations following the news of the quarantine being lifted at HITS Ocala and other quarantined facilities. Riders and trainers that were uncertain about their showing plans may still contact Stadium Jumping to reserve stalls. With the good news out of Ocala, Stadium Jumping has modified the requirements for horses entering the Bob Thomas Equestrian Center. Horses will be required to have a current health certificate or a certificate of veterinary inspection on a licensed veterinarian letterhead. Vaccinations must be up to date. The Tampa Equestrian Series will strive hard to keep all its attending horses safe and healthy while they compete at the Bob Thomas Equestrian Center. Management will provide temperature charts to all exhibitors upon arrival with instructions on charting temperatures twice daily. The two-week equestrian event will be held at the Bob Thomas Equestrian Center at the Florida State Fairgrounds in Tampa, FL. The Tampa Equestrian Series also features the 41st Annual $200,000 Gene Mische American Invitational presented by G & C Farm, held under the lights at Raymond James Stadium on April 6, 2013. The world’s top equestrians will come together for Tampa Equestrian Series’ two weeks of competition, held from March 27 – April 6, 2013, to vie for the winning titles at this prestigious event. The Tampa Equestrian Series will kick off its two weeks of competition with the Tampa Bay Classic, which is scheduled for March 27-31, 2013. It will include the $25,000 Tampa Bay Welcome Stake on Friday, March 29, and the $35,000 Grand Prix of Tampa on Sunday, March 31. The ‘AA’-rated hunters will also be featured with divisions for professionals, juniors, and amateur-owners. The Tournament of Champions is next, and will be held April 2-6, 2013. The $10,000 American Invitational Stake Class will be held on Thursday, April 5. The 41st $200,000 Gene Mische American Invitational, presented by G&C Farm, which will take place on Saturday, April 6, 2013 at Tampa’s Raymond James Stadium. America’s “Super Bowl of Show Jumping” is a historic event, which brings together the top horse and rider combinations in the world. Invitations for the event are extended to the top thirty equestrians on the USEF National Computer Ranking List, plus past and present Olympians and other top invitees. Annually, this event showcases exhilarating equine power, amazing speed and agility, and equestrian excellence at the home of the NFL’s Tampa Bay Buccaneers. The day is filled with extraordinary entertainment and activities for the entire family to enjoy. The Mane Event Kick-Off Party will start at 4:00pm in Lot 5 of Raymond James Stadium with great fun for kids of all ages. There will be face painting and a Horseless Horse Show presented by JustWorld International, as well as autograph and photo opportunities. The gates open at 6:00 pm. with a traditional course walk for the public. The Opening Ceremonies get underway at 7:00 p.m. with the Parade of Tampa Equestrian Festival Series Champions and a special tribute to “Our Heroes.” The first horse will show over the course beginning at 8:00 p.m. as they compete for the winning honors. Tickets for the Saturday night spectacular are on sale now, online at: www.stadiumjumping.com. Ticket prices $30, $25, $15, Group Discounts for 10 or more persons. For more information on Stadium Jumping, Inc. and the 2013 Tampa Equestrian Series, please call (941) 744-5465 or please visit www.stadiumjumping.com. For accurate and up to date information on EHV-1 in Florida, go to the State of Florida Department of Agriculture Division of Animal Industry website at http://www.freshfromflorida.com/ai/pdf/EHVWebsiteUpdate.pdf. WHAT: Two-week hunter/jumper horse show circuit produced by Stadium Jumping, Inc. and the 41st Annual $200,000 American Invitational presented by G&C Farm, which features the world’s best equestrian athletes. Information is available online at www.stadiumjumping.com. WHEN: Daily 8 a.m. to 5 p.m.
41st Annual $200,000 Gene Mische American Invitational CSI 3* – April 6, 2013, 7 p.m.
Saturday, April 6, 7 p.m.: 41st Annual $200,000 Gene Mische American Invitational CSI 3*, presented by G&C Farm. To kick off the evening activities, the public is invited to participate in the traditional American invitational course walk. This is an opportunity for spectators to marvel at the size and breadth of the jumps equestrians will navigate their horses over. Corporate and individual sponsors may participate at any level. Tickets are $15-$30. Senior citizens, active duty members, and group discounts are available. For more information on sponsorship levels or to purchase tickets, please call 1.800.237.8924. The 41st annual American Invitational, one of the world’s richest equestrian show jumping competitions, has been held at Raymond James Stadium in Tampa, Florida since 1971.The Invitational is the only major equestrian competition to be held in a NFL football stadium. Tampa, FL – February 28, 2013 – The 2013 Gene Mische American Invitational presented by G & C Farm returns to Tampa’s Raymond James Stadium on Saturday, April 6, 2013 at 7:30pm. This year marks the 41st anniversary of this enduring classic and as always, promises to be a magical night of show jumping as the world’s greatest riders and horses gather in the Tampa Bay area to decide the American Invitational title. Over the years, the American Invitational has been recognized as the crown jewel of American show jumping, and year in and year out, has been one of its toughest tests. Often called the Super Bowl of Show Jumping, the event also offers one of the biggest purses in all of equestrian sport. The $200,000 Gene Mische American Invitational takes place on Saturday, April 6, 2013 at 7:30 p.m. The gates at Tampa’s Raymond James Stadium open at 5:30 p.m. Included will be the always popular public course walk, plus fabulous opening ceremonies. The historic 41st $200,000 Gene Mische American Invitational, presented by G&C Farm, brings together the top horse and rider combinations in the world. Invitations for the event are extended to the top thirty equestrians on the USEF National Computer Ranking List, plus past and present Olympians and other top invitees. For more information on Stadium Jumping, Inc. and the 2013 Tampa Equestrian Series please call (941) 744-5465 or please visit www.stadiumjumping.com.